Close Encounters: A New Post Industrial Landscape is an architectural film that uses time-based media as a generative design tool. It outlines the potential of using technological artwork as a means of spatial production, rather than as an after-the-fact representation device. The project imagines the fictional appropriation of an industrial landscape at the edge of Montreal. Pointe-aux-Trembles is densified and rehabilitated while maintaining the area’s current industrial activities, including petrochemical plants, refineries and metal recycling. The thesis proposes an autonomous ecosystem of quasi-spontaneous architectural and urban elements, addressing the tensions arising from the close proximity of habitable spaces and toxic landscapes. Through repeated digital experiments, the project sets up a parasitic architectural infrastructure woven into the industrial fabric. Architectural narratives materialized from an obsessive study of the East Montreal industrial park. 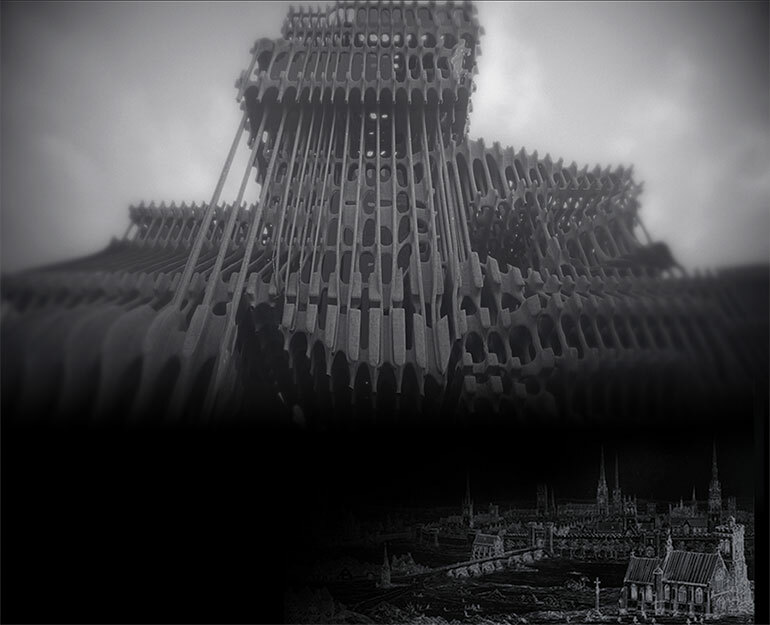 Rich imagery and fictional processes opened the ground for investigating a future built environment in this part of the city. By exploring the interaction between different milieus, the interventions also begin to unveil the social and political roots of “the natural.” The new environment navigates the boundaries between binaries: pure/toxic, landscape/architecture, natural/man-made, nature/culture. This project leads toward a contemporary rethinking of the role of architects in the shaping of our urban environment. It proposes using the rough edges and cast-offs of design processes, seeking imperfection to pursue the anachronistic and unknown. MF: This is a study of how we can use computer modeling tools to create space and atmosphere in better, more involved ways. This is a very good start to studying a new way of doing things. PH: The research project’s primary goal is to use a time-based digital program as a way of generating architectural form. The time-based quality creates an opportunity to imbue the project with emotive qualities and a sense of place. JH: The project is really alluring: it’s bold, atmospheric and potent. Unlike typical parametric architecture, this project has a sensibility that’s unique and powerful. There’s a recognizable reference to the gothic, but there’s also something in the aesthetic that is entirely new.